Starting in 1996, Advantage Auto Repair & Transmisson service technicians have been able to use a standardized diagnostic system to help determine what is wrong with a vehicle. This diagnostic system works in tandem with the Engine Control Modules for each vehicle's engine. The Engine Control Module is a computer that monitors and controls many engine functions. If the Check Engine light is burning steadily, it indicates a problem that needs to be taken care of soon. If it is flashing, however, the vehicle needs immediate attention at Advantage Auto Repair & Transmisson. When the Check Engine light is flashing, the vehicle should not be driven at high speeds, haul heavy loads or tow a trailer. Tucson drivers need to understand that doing so can cause major damage. When a vehicle is brought to Advantage Auto Repair & Transmisson in Tucson because the Check Engine light is on, a technician will scan the Engine Control Module to learn why it turned the light on. The answer comes as a “trouble code.” The technician has access to software that allows him to enter the code and find out what it means. The software will also let your Advantage Auto Repair & Transmisson technician know what might be causing the problem and how to diagnose it. Notice that the trouble code does not tell your technician at Advantage Auto Repair & Transmisson exactly what is wrong with the vehicle. It can only let him know where to start looking to find the problem. Scanning a trouble code and determining what it means is fairly simple for the pros at Advantage Auto Repair & Transmisson. But the ensuing process of actually diagnosing a vehicle's trouble can take a skilled technician some time. Sometimes this can add up to a significant repair bill. Some vehicle owners mistakenly believe that the “trouble code” is all they need and think they can then fix their vehicles themselves. Some have tried to save money by purchasing an inexpensive scanner, or they take their vehicles to an auto parts store that offers the scan for little or no cost. These options are often not the money-savers they seem for Tucson vehicle owners. They can end up costing the vehicle owner extra in unnecessary repairs and engine damage. For example, the trouble code P0133 reads “Bank 1 sensor 1 circuit slow response.” Translated, that means the front oxygen sensor shows a slow response time in changing the mix of air to fuel. The seemingly obvious conclusion is that the sensor needs to be replaced. The vehicle owner purchases a sensor, installs it and happily goes on his way. However, read the trouble again: a slow response time in changing the mix of air to fuel. Nowhere does this indicate that the sensor is bad. There are a lot of parts involved in changing the air-fuel mix, any of which could be causing a slow reaction time. Those include a bad or contaminated airflow sensor, an exhaust leak, a problem in the electrical system or a leak in the intake manifold. The sensor is merely relaying that the response time is slow; it doesn't indicate where the trouble is. So the vehicle ends up with an oxygen sensor it did not need, and the delay in repairing the actual problem may have led to further damage to the engine. Both are added costs for the vehicle owner. Cheap scanners also don't have the ability to read the history stored in an engine's computer. This operating history contains clues that can help in diagnosing engine trouble since it can indicate a developing problem. 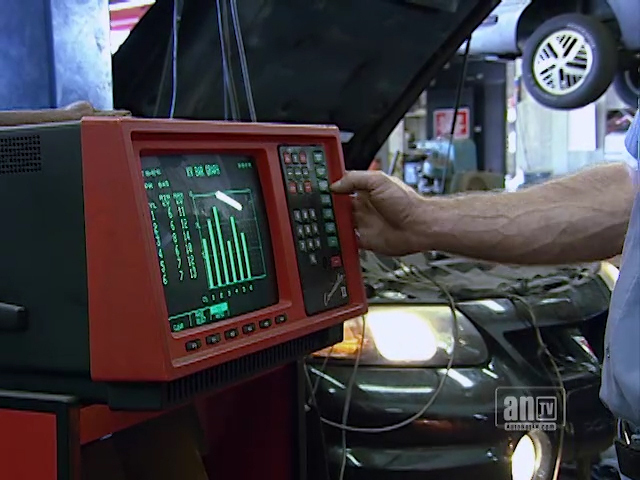 Advantage Auto Repair & Transmisson invests a lot of money in high-end diagnostic equipment so that we have access not just to service codes but also to the operating history of the engine. On-board diagnostics, then, are a tool to help diagnose what is wrong with a vehicle. They cannot specify what part needs to be fixed or replaced, and they cannot replace a well-trained and well-equipped service technician. Unless you are a trained mechanic, it's good auto advice to use Advantage Auto Repair & Transmisson for your car care. In the long run, it can save you time, unnecessary expense and frustration. Advantage Auto Repair & Transmisson can also help you keep up with your scheduled preventive maintenance, which can also save you on repair bills by alerting you to potential problems before they get expensive. Okay. You went to your local Tucson car wash, and while your vehicle was under the dryer, the Check Engine light started flashing. Panic! What did you just do? Something is seriously wrong with the vehicle! You head for the nearest Tucson service center, but on the way, the Check Engine light stops flashing and just glows red. Hmm. Maybe things aren't as bad as they seem. You decide to wait until payday to take your vehicle in to get serviced. In the meantime, the Check Engine light goes off. What? You decide the light must be faulty; maybe when it comes on it doesn't mean anything, or maybe it's just in your vehicle as some sort of scam to get you to pay for unnecessary repairs. You're glad you didn't take your car to the Tucson repair shop and resolve to ignore that Check Engine light in the future. Whoa! Let's look at what really happened. Your vehicle was under an air dryer. Your air intake sensor measured too much air running through the engine. It sent its report to the engine computer, where a warning was triggered; there shouldn't be that much airflow when the vehicle engine is idling. This is a serious problem that could cause permanent engine damage. Warning! The Check Engine light starts flashing, letting you know you need to take immediate action to prevent that damage. You drive out from under the dryer, and the air intake sensor sends a new message to the computer. The computer realizes that everything is normal and tells the Check Engine light to stop flashing. The vehicle doesn't need immediate attention; but there was a problem, and it should be checked out by your Advantage Auto Repair & Transmisson service advisor. After a few days the computer senses that the problem is gone, so it turns off the warning light. You may think this story illustrates the uselessness of a Check Engine light, but you should remember that a computer can't think for itself; it can only follow its programming. It doesn't know the difference between a car wash air dryer and a serious malfunction in your vehicle engine. That doesn't make it useless. It just means you have to be the smart one. Being smart doesn't mean ignoring your vehicle Check Engine light. It lets you know when something is wrong, and you can prevent a lot of damage to your vehicle by paying proper attention to it. Your engine computer is constantly collecting data about what is going on inside your vehicle engine. It knows what parameters are normal and when a reading may indicate a problem. It uses the Check Engine light to let you know when something isn't right. It then stores a code in its memory — which a technician can retrieve — that indicates which reading was abnormal. The technician uses this code as a starting place to find out what's wrong with your vehicle. It's like going to the doctor with a fever. The fever is the reading that is abnormal — your temperature is too high — but the doctor still has to figure out what's causing it. It's probably an infection, but what kind? Sinus infection? Appendicitis? Flu? The problems and their solutions are quite different. But a fever also tells a doctor what's NOT wrong with you. Fevers don't accompany stress headaches, ulcers or arthritis, so there's no sense in testing for those conditions. The pros at Advantage Auto Repair & Transmisson respond to a trouble code in your vehicle's computer in the same way. The code doesn't say exactly what's wrong, but it does give the technician a good indication of where to start looking —and where he/she doesn't need to look. Now, you wouldn't consider diagnosing yourself with a serious medical problem — good medical advice unless you're a doctor. So you shouldn't consider trying to diagnose your vehicle's troubles by yourself — good auto advice unless you're a trained mechanic. There are cheap scanners available on the market, and some Tucson auto parts stores offer to read trouble codes from your vehicle engine's computer for you. But these are really not good alternatives to taking your vehicle to a qualified service center such as Advantage Auto Repair & Transmisson in Tucson. Your engine's computer has both short-term and long-term memory, and there are some codes that are specific to a particular make of vehicle. Cheap scanners can't read an engine computer's long-term memory nor can they interpret manufacturer-specific codes. That's why our manager at Advantage Auto Repair & Transmisson spends a lot of money on high-end diagnostic tools. It's as if you had a choice between a doctor who had a tongue depressor and a thermometer and one who had all the latest medical diagnostic equipment on hand. Honestly, which would you choose? Getting your codes read at your Tucson area auto parts store isn't really a money-saver, either, unless you're a trained mechanic. You'll end up with a code that tells you a symptom. What usually happens next is that the Tucson area parts store sells you something that directly relates to the symptom. It may or may not fix the problem. It's actually cheaper to just go to Advantage Auto Repair & Transmisson and get things fixed right the first time. Remember, a fever can indicate a sinus infection or appendicitis. An antibiotic may be okay for that sinus infection, but it likely won't help your appendicitis. Is it really wise to wait around to see if the antibiotic helps when you might have appendicitis? Part of good vehicle care is knowing where you can get a problem fixed — and fixed right. Preventive maintenance goes a long way to keeping you out of the repair shop, but eventually, we will all have a problem that needs fixing. Let's do it right the first time at Advantage Auto Repair & Transmisson. When we Tucson residents get a car repair bill, we really shouldn't be surprised to find “diagnostic fees” as one of the line items. When we get a computer fixed, there is usually a charge for the time it takes to diagnose the problem. When we go to a medical doctor, most of his fee is for his ability to diagnose what's wrong. It's no different with our vehicles. Some diagnoses are fairly simple. Brake repairs at Advantage Auto Repair & Transmisson usually require only a visual inspection, for instance. But other problems are much more difficult to diagnose. An intermittent engine problem, for example, takes time and expertise to pinpoint. Modern vehicles have multiple computers that monitor a variety of sensors throughout the vehicle. When one of those sensors has a reading that is higher or lower than the standard parameters, the computer turns on the Check Engine light. Technicians at a service center such as Advantage Auto Repair & Transmisson in Tucson can scan the engine's computer for a trouble code. This code tells the technician which reading is too high or too low. That's where some Tucson residents get confused. They think that this reading concludes the diagnosis, and they don't understand why the diagnostic fee is as much as it is when all the technician did was to scan the computer. But the truth is the trouble code is only the beginning of the diagnostic procedure. Remember, the trouble code only tells which reading is out of parameter. It doesn't say what is causing the reading to be too high or too low. Your Advantage Auto Repair & Transmisson service technician still has to find the underlying problem. It's a lot like going to the doctor. He can take your temperature and discover that you have a fever, but that doesn't tell him what is causing your fever. Automotive diagnostic technology can cut down the time it takes to figure out what's wrong with a vehicle that isn't running right. But it doesn't do away with the need for your friendly and knowledgeable Advantage Auto Repair & Transmisson service technician to make a proper diagnosis. Car care, like medical care, still requires the human touch. There's a reason we use the word “diagnose” when we talk about fixing cars in Tucson. Figuring out what's wrong with your vehicle has a lot of similarities to figuring out what's wrong with someone who is ill. Vehicles are a mass of complex systems that can produce a variety of symptoms when something goes wrong. As with human diagnoses, a specific symptom may be indicative of a number of problems, and figuring out the specific cause takes training and experience. Sometimes the diagnosis of your vehicle's trouble comes down to a matter of trial-and-error. This can be frustrating for Tucson drivers because time and money are on the line. You may feel you should only be paying for repair work. Of course, you only want to pay for the right repair – and a proper diagnosis is part of getting it right. Like at the doctor's office — some of what you pay for is the doctor's time and effort to figure out what's wrong with you, not for the actual cure. The good news is that Tucson drivers can do a lot to help out their friendly and knowledgeable service advisors at Advantage Auto Repair & Transmisson in figuring out what's wrong with their vehicle. Again, the medical office is a good analogy. The more information you can give your doctor about where it hurts, when it hurts and how it hurts, the more quickly he will be able to help you. In the same way, the more you can tell your Advantage Auto Repair & Transmisson service technician about when the problem occurs, what is sounds like, how often it occurs, where it occurs, etc., the more efficiently he will be able to get you back on the road. Good preventive maintenance goes a long way to keeping your car out of a Tucson repair shop, but if you need to get it , good communication will get you back on the road quickly. Modern Tucson vehicles have several computers on board that control all kinds of things like engine functions, transmission shifts, traction control, anti-lock brakes, stability control, emissions – and on some vehicles, even steering, braking and the throttle. Think about that for a minute – things that used to be controlled by simple mechanical connections now have electronic controls that rely on computers, software and sensors. It's no wonder that when something goes wrong with their vehicle it can be pretty complicated for Tucson drivers to track down the source of the problem. To help your service advisor at Advantage Auto Repair & Transmisson figure out what's wrong, your vehicle is equipped with on-board diagnostics. The Check Engine light comes on to tell you there's a problem and the engine management computer stores a trouble code. Your friendly and knowledgeable Advantage Auto Repair & Transmisson technician connects a scan tool to your vehicle's diagnostic port and retrieves the trouble codes as well as other important data. Trouble codes are like clues for the technician to follow as he diagnoses what's wrong with your vehicle. In a way, it's like going to your Tucson doctor with a problem. She'll run some additional tests and gather the information she needs to make a diagnosis and form a treatment plan. How much a vehicle diagnosis costs at Advantage Auto Repair & Transmisson in Tucson depends on how much time it takes to sort out the symptoms and find the underlying problem.